The standard radial spherical plain bearing is characterized by an outer ring with a single split in the axial direction. The outer and inner ring are made of chrome steel that is hardened and phosphate treated. The sliding surface is treated with molybdenum disulfide. In addition to the treated sliding surface, the bearing receives lubrication through ports on the inner and outer bearing wall. Due to the molybdenum disulfide treatment and ability to self-lubricate, these bearings experience high wear resistance. 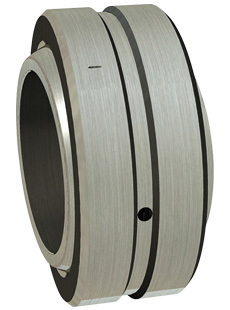 This bearing performs well in applications exposed to dusty environments. Load carrying capacity will be reduced at temperatures exceeding 180°C. Lubricant temperature ranges must also be taken into account. Please contact Hi-Tech Seals if your application experiences high temperature ranges.